Modern travelers are hyper-connected and cannot bear to be offline. Business travelers need to be able to check their emails and take online conference calls, while leisure travelers are eager to use the internet to connect with friends and family, discover local attractions, and enjoy music and videos after a long day of travel. 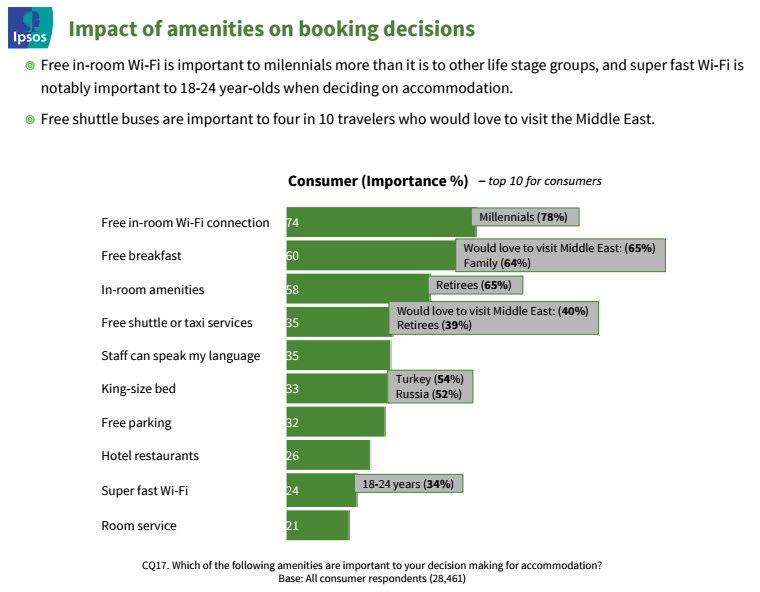 The 2015 TripAdvisor TripBarometer further reveals that Wi-Fi is the most important in-room amenity for today’s travelers. Given the critical importance of Wi-Fi to guests, hospitality decision-makers are keeping a watchful eye on their hotels’ Internet service offering. 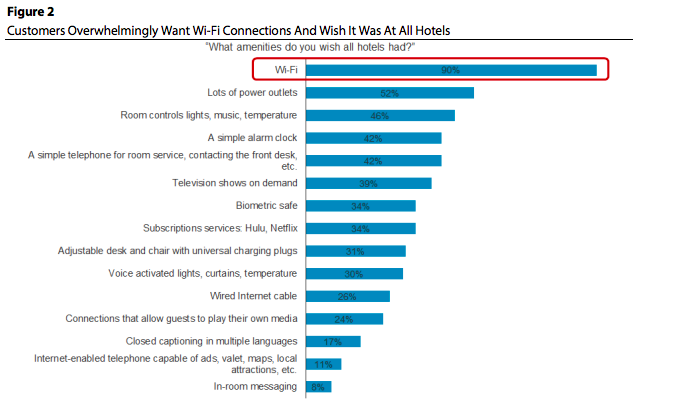 However, the effects of poor Internet service on guest satisfaction and consequently on hotels’ online reputation have yet to be thoroughly explored. 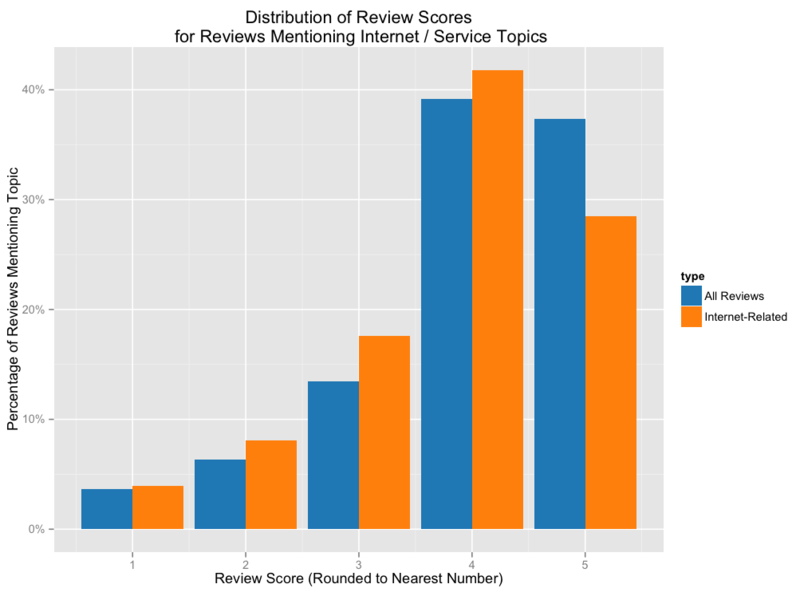 We found that internet-related reviews have lower average scores (3.8 vs 4.0) than reviews that don’t mention Internet services, suggesting that when the Internet is mentioned in a review, it is normally seen as a drawback to the hotel experience. A deeper look into the data reveals that internet-related reviews seem to most negatively affect the occurrence of five-star reviews. From our investigation, we can infer that there are fewer five-star reviews that mention Internet because people expect perfect Internet service. Since it’s expected, they don’t think to write about it when it’s flawless. But when they don’t have a good Internet experience, they can’t award a hotel five stars. To take the research one step further, we looked at what topics were routinely discussed in relationship to Wi-Fi and outlined some simple steps to combat the problem. Others actively dissuade other guests from booking with that hotel because of their poor Internet. How to address speed issues: Test the speed of your Internet connection and compare it to the average in your local area. If you are below the average, talk with your Internet service about how to increase the speed of your connection. When discussing Internet service upgrades with your IT department, it is good to have an idea of what your users will need. Faster is always better, but the reality is that hoteliers have budgets to stick to. Take the time to understand how your guests are using the Internet and choose your service plan accordingly. To give a bit of context of what guest are used to in the United States, Comcast, a major American internet provider, starts at speeds of 3Mbps for $40 per month, and ramps up to 105 Mbps for $200 per month. Reliability: After speed, the reliability of an Internet connection was a major concern to reviewers. While light Internet use (email, web browsing) is possible on an intermittent connection, video and music streaming services require a strong, consistent connection. Moreover, business travelers depend on cloud software (Salesforce, Marketo, etc.) and VPNs (GotoMeeting, join.me) that require a dependable always-on connection; intermittent connections can make business travel disastrous. “I had a purchased a 24hr block of wireless internet […] but could barely get a signal because the room was so far away…I eventually realized that I needed to go on the balcony to get a good signal”. The image of a guest wandering around his room searching for the optimal signal so he can continue a conversation with his friend seems ridiculous – but one that happens too often. On a recent business trip with a colleague, I was amused to find that I received a strong signal in my third-floor suite, while he struggled to load a page from his fifth-floor suite. How to address: If you provide wireless Internet at your property, walk around with a phone or laptop and monitor the strength of your Wi-Fi connection on different floors and sides of the property. If your wireless Internet signal is not powerful enough to reach all areas of your property, you may need to invest in equipment to expand its range. Security/Privacy: With public awareness of identity theft and personal data, reviewers are mentioning security and privacy concerns more frequently.If the Wi-Fi network is insecure, their browsing could be hijacked, video calls could be monitored, and most importantly, their financial information could be compromised while making online purchases. How to address: Ensure that your Internet connection is protected with WPA2 encryption. This is built into almost all Internet routers and should be relatively easy to do. Ensure that your password isn’t publicly displayed in your hotel. And preferably, provide each guest with an individual password and username. Knowing that the average review score is a 4.0, and knowing that Internet-related mentions in reviews brings down the average to a 3.8, it’s critical that hotels look at their Internet service as a make-or-break amenity. In today’s world, just a few negative guest experiences can result in bad reviews that can hinder future bookings. I recall around 1990 suggesting to my fellow board member operating a chain of 4/5 star hotels under a leading brand name,that we should offer free Wi-Fi. It was rejected out of hand as something that was not a guest need and would lose phone revenues! Seems we are still catching up. Mind you, the same people rejected the introduction of duvets! Felipe gets it right when he says that many hotel guests complain about the internet, but he is mistaken when he says that “speed” and distribution are the problems. Speed – All internet traffic moves at the same speed. What is lacking is throughput. This is an important distinction. Think of data flow as water moving through a pipe. If your city’s water pressure is 80 PSI and you have a half inch pipe coming into your house, the water pressure (or speed) is fine, just don’t try to take a shower and run the washer at the same time. Make the pipe bigger, say one inch, and you can turn on the bath, take a shower, wash the dishes and water the garden at the same time though the “speed” hasn’t changed. Distribution – Measuring a wireless system’s penetration, as Felipe suggests, is a good first step. However, it is only about 10% of the story. You only know that the guests can “see” the wireless signal, but you have no indication of whether their devices can broadcast back to the access point or whether the access point is capable of handling all the wireless connections in its broadcast range. Most residential-grade wireless access points can support 6-7 simultaneous connections, while most commercial-grade access points can host 20-30 without locking up or bogging down. There are some commercial-grade products that can handle hundreds or even thousands of simultaneous connections, though I have rarely seen these used in hotels or convention centers. Poor cabling, inadequate switching, and improperly configured systems are also very common at hotels. In the end, it takes an IT professional to design, install, and maintain a wireless network capable of supporting a hundred or more simultaneous connections. Unfortunately, it is typically well beyond the capability of hotel staff or even the local internet provider. At AcmeComputer.com, We typically hear from hotels after their sales have slumped along with their online ratings. My advice is that every property establish an IT budget, develop a relationship with a reputable IT firm, and stick to a 36- to 48-month equipment replacement schedule. thank you for the nice article based on getting reviews for hotels. If you are in a remote place all alone the first thing you want is Internet and hotels have now understood it. Internet has become a habit. Your statement about guests wandering the hotel hallways trying to pick up a usable Wi-Fi signal is funny and true. I’ve been there too. The key takeaway for hoteliers is that every minute that hotel guests spend trying to connect to the internet or deal with signal issues (and getting frustrated in the process), is time they are not enjoying their stay. That can indeed lead to bad reviews and fewer repeat bookings. That is why I suggest hotels consider getting rid of all Wi-Fi limitations such as per guest passwords, expiration times, number of device limitations, and internet access registration forms. With the help of an IT professional, a hotel can even set up an open Wifi network that requires no password and instantly works for all guests and is still secure. If McDonalds and Starbucks can do it, hotels can do it too. Perhaps one day hotel WiFi will be just like water and electricity and TV – it just works without the slightest effort.